I think I wanna know ya! Today I’m taking another look at a fairly new 100% vegan restaurant. Quite frankly, Thai Vegan is my greatest loooove of all. This place is magic. I discovered it by accident last December, introduced it to Ryan, and we eat there 2-3 times a month. When it comes to the menu, I totally play favorites. If I’m at Thai Vegan, I’m getting the spicy eggplant with tofu every time. Delicious blend of Thai basil, tender eggplant, chewy tofu, and soul-shattering spice. I have to ask for a level 1 because level 5 will give me an asthma attack. Yowza! Everything is so freaking fresh and filled with veggies. The flavor is always amazing, and the portions are legit. I’ve tried to make my way through the menu, but I am so in love with my favorites that I have to force myself to try something new. Another dish I love is the green curry with tofu. Loaded with basil, bamboo shoots, bell peppers, onions, and tofu, it is super filling and makes great leftovers. As for dessert, don’t miss out on the mango with sticky rice or the banana spring rolls! Another favorite is the Thai iced tea. Beware: it is super sweet. I love it, though. Thai Vegan also has a great selection of appetizers. We really love the tofu satay. Also a big fan of the spring rolls. Additionally, the restaurant offers the following options for your protein of choice: tofu, soy chicken, soy fish, soy shrimp, or soy chicken nuggets. 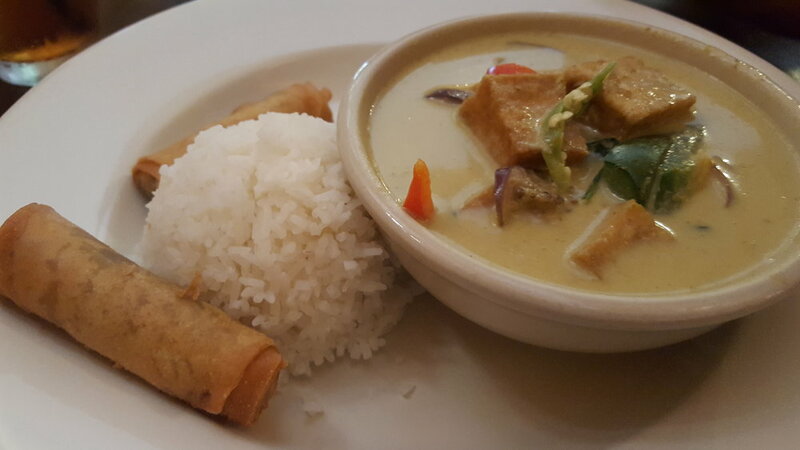 We always get the tofu because it is just ridiculously good. They even have unexpected things on the menu like falafel, burgers, and lentil loaf. On my most recent trip, I tried out the jungle noodles with tofu. They were spicy, flavorful, and looked like a rainbow. Super delicious, and I definitely recommend it. I also tried the yellow curry with tofu for the first time. This would be perfect when the temperatures finally start dropping. Hearty potatoes,carrot, onions, and tofu in a thick yellow sauce. Super warming and also makes great leftovers. If you aren’t hungry already, I dunno what to tell you. 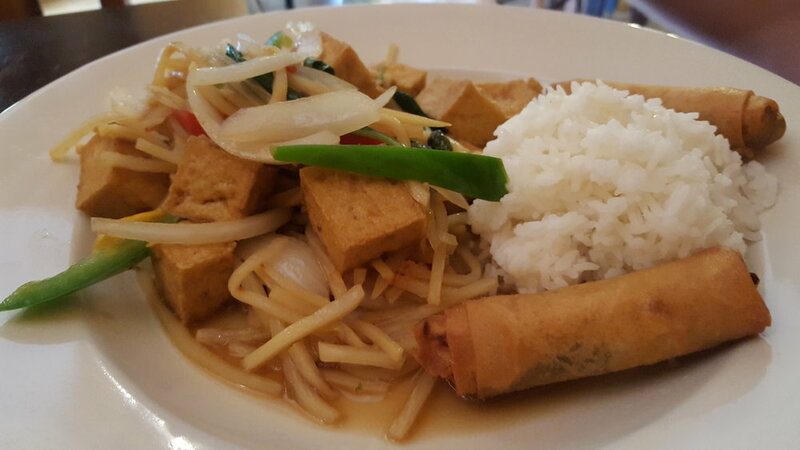 Thai Vegan is the place to be, so go give them your money. Head’s up: they’re closed on Tuesdays! How vegan-friendly is it? 5 out of 5 nooches. This place is 100% vegan and 100% delicious. I have already eaten there twice in the last week. Obsessed is an understatement. A ha! Caught your attention like a live-action pencil sketch video from the 80s. Today’s MoFo is all about super secret finds. I ventured all the way to San Antonio’s west side in order to find some banging vegetarian Vietnamese food. BobaTea Garden opened up sometime in early 2017 from what I could gather. I was deep in an internet search for boba tea, when I happened upon this 100% vegetarian restaurant that piqued my interest. My hesistance to try it before yesterday was solely based on distance. I’m telling you now: I would absolutely drive to another city to get in on this deliciousness. Ryan and I were both seriously suprised at how good and fresh everything was. When you walk into the restaurant, you are greeted by the delightful smells of lemongrass and spicy peppers. The locations is super clean and very bright with storefront floor to ceiling windows. The decor is very minimalist, finished with a few simple portraits and live plants. It’s a very calming effect. Customer service was very friendly and the owners were welcoming as guests entered. Ryan and I got a few items to try. 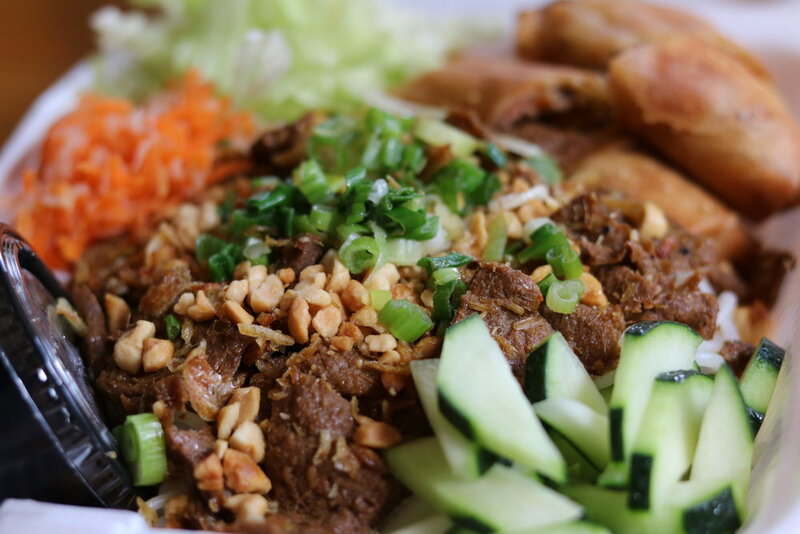 Ryan opted for his usual: spring rolls with vermicelli and a lemongrass “beef.” The ingredients look so vibrant and are incredibly fresh! I wanted to try a few items to give a decent review. I ordered a Chinese BBQ “pork” banh mi, which was a delight! It had vegan pork, ham, cucumber, jalapeno, sweet and sour carrot daikon pickle, pate, and mayo on a deliciously soft and crusty baguette. Duuuuudes. The most amazing sandwich. I also tried the grilled lemongrass “chicken” that came with broken rice and fresh veggies. Super good. I even ate this cold and it tasted just as good. Yummy! I also got a pina colada boba tea…made with fresh fruit! Flavor: Lemongrass, peppers, cilantro. Bold and flavorful. Price: The most expensive thing on the menu is $12. Most items are less than 10 bucks. Ingredients: Everything is fresh and vibrant. Beautifully plated. Cleanliness: Eat in restaurant for a bright and cheery experience. How vegan-friendly is it? 4 out of 5 nooches for the food menu/3 out of 5 nooches for boba drinks. This restaurant is 100% vegetarian and about 90% vegan. There are only three dishes that are not vegan (as they contain eggs). Less than half of the drinks are vegan-friendly, but all of the toppings are. Overall, an impressive and unique spread. Please go out and support this vegetarian and small local business. The owners are super nice and the food is absolutely amazing. When I want food in a hurry, I can think of no greater gift than p to tha izza. My boyz Leo, Raph, Mikey, and Donnie weren’t faking the funk. A great slice of pie will bring the cowabunga out of anybody. The greatest thing about the past few years is how many national chains are providing vegan cheese to the masses. In San Antonio, you can grab yourself a slice at franchises like Mod Pizza, Urban Bricks, and Pieology. However, there is one game in town you just do not want to miss. Pizza Classics is a happening pizza spot located on N. St. Mary’s, right across the street from the Bombay Bicycle Club. A short walk from Brackenridge Park and the Japanese Tea Gardens, it is in the middle of a developing neighborhood. Expect some construction and a bit of congestion at times. Tucked away in a tiny parking lot, this space fills up quickly at peak times. The restaurant is fun, with colorful green walls covered in license plates. A juke box sits next to the soda machine playing tunes as patrons scarf down on some delicious food. There are a handful of booths and small tables, enough to come with a partner or with the homies. Paper Straws: They recently switched from plastic to paper straws. So, the next time you’re craving something quick and easy for that Game of Thrones rewatch, slide on over to Pizza Classics and up your vegan pizza game. Welcome to Local Week, a week dedicated to all the great finds in my wonderful city of San Antonio, TX. For those of you who do not know, San Antonio is the fastest growing city in the nation! From July 2016-July 2017, we gained over 24,000 new residents. We can definitely feel it! When I made my way to California in late 2008, there was only one 100% vegetarian business in San Antonio at the time. In order to find out if things were vegan in any restaurant, you’d have to specifically ask. There was no such thing as vegan brunch and you could forget about cruelty free BBQ. In less than a decade, the landscape has completely transformed! We have a vegan butcher, bar, Thai food, and have even entered the food truck game. This week of MoFo is about giving love to all the places that bring me joy. 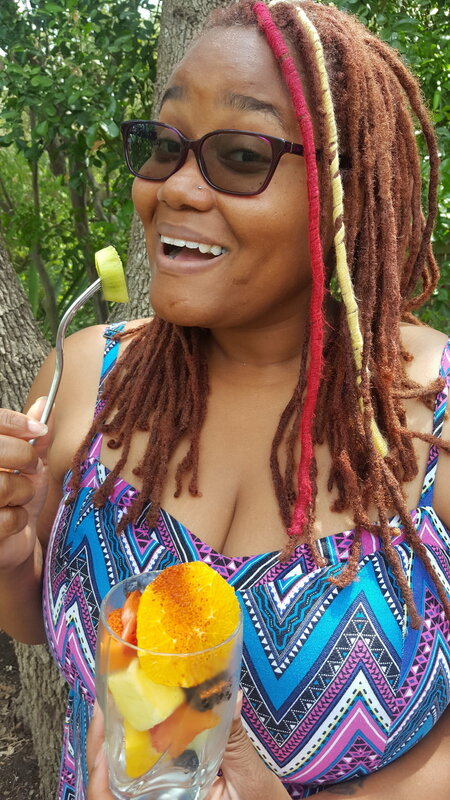 I’ll be visiting local restaurants and grocery stores and blogging all about my finds. I even threw in some places I’ve never been before in hopes of discovering new traditions. Let’s get started! Welcome to Earth Burger, home of the Earth burger. You’re gonna want them to take your order! This place is so cool and fun! San Antonio’s official first and only vegan fast food spot. This place will make you forget all about those golden arches as you geek out on the kale salad. Yes, kale salad, Grrrl! Earth Burger opened to hungry mouths in 2014. Originally it was vegan with the option of dairy cheese. However, as they grew and expanded, the plant-based joint became 100% vegan…and I’m loving every minute of it. I have tried everything on the menu multiple times. My absolute favorites are the Spicy Chik-N Sandwich combo, Chik-N Tender Basket, and Strawberry Earthshake. It’s seriously like being a kid again. Healthy Sides: How about apple slices, hummus, kale salad or edamame? Eat good food and feel great! How vegan-friendly is it? 5 out of 5 nooches. 100% of the menu items are vegan. Bonus points because they offer gluten free for the Earthburger and BBQ Pulled Jackfruit. You can also turn any burger into a lettuce wrap! This is a place you have to stop by and visit. The decor is so bright and cheery! Even the drive thru brings a smile to my face with all the vibrant colors and anthropomorphized veggies thanking me for devouring their precious little souls. Come on down to Earth Burger for a tasty treat or two! IMPORTANT: Earth Burger is closed every Saturday for religious reasons. 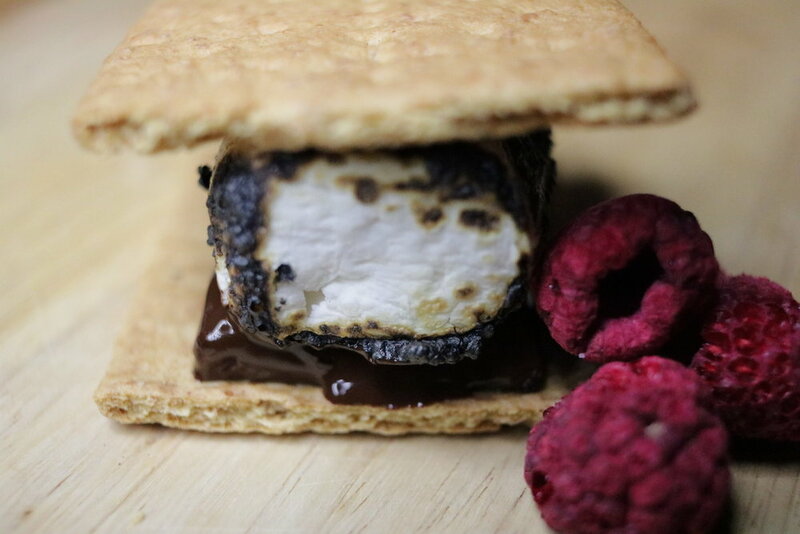 Nothing quite captures an outdoor adventure like the camp classic s’mores. These things will turn the most crotchety adult into an excited, wide-eyed kid in mere moments. I don’t know if it’s my love of The Sandlot, or the connection to campfires and outdoors but s’mores instantly put a smile on my face. Although it’s not always easy finding vegan options, Ryan and I have done handfuls of trips and brought s’mores along. The best advice I can give is to plan ahead. When we go on a trip, I make sure to grab a bag of Dandies and the only readily available vegan graham cracker I can find, Nabisco. I usually grab a couple of chocolate bars from work. You can pack them into a meal prep box and throw them with your camping supplies or take them on a flight. Most of the time I forget I even packed it until we are at our campsite, so it makes for extra magical nights. For even more magic, I try switching things up with new cookie/chocolate combos. Here are some tasty combinations that may make your starry nights even more spectacular. As always, the instructions are simple: graham, chocolate, flaming ‘mallow, graham. Then, you scarf. Always remember that adventure doesn’t stop when the hiking boots are kicked off for the day. Little changes to your campfire traditions can make wonderful and extraordinary memories. The possibilities for this are truly endless. Remember to plan ahead and thank yourself later. Thank you so much for checking out Vegan Backpacker week! See you tomorrow for the beginning of my local spotlight. Today’s blog is all about Outdoor Herbivore*. I dunno how most people do Vegan MoFo, but I am all about the research. I knew I wanted to dedicate a week to camp food, but I was interested in new and exciting vegan finds. I happened upon this Ultimate Guide to Vegan Backpacking and noticed there was a tofu scramble. Hell yeah! Breakfast tacos! A little bit about Outdoor Herbivore. The company was started in 2010 with several goals in mind: local ingredients, vegetarian options, less sodium, easy prep and less waste. All of their food is vegetarian with a ton of vegan options. All of the meals are also no cook, just requiring boiling water or cold water. Pricing is pretty inexpensive compared to a lot of the stuff I’ve found in outdoor stores while on road trips. They also offer single or double sizes, which is fantastic! But how does the flavor stack up? I tried the sunrise tofu scramble and Pacific Crest vinaigrette salad. The scramble was delicious! I added nutritional yeast to it and made breakfast tacos with Cholula. The salad was…okay. I think I would have loved it had it not been so onion-forward. If you like onions, though, it is a very refreshing change from dry, heavy camping/hiking food. Definitely check out and support this company if you are a vegan outdoor enthusiast like myself. So many great options that won’t leave you bored in the backcountry! Come back tomorrow for the last day of our 4 day vegan backpacking adventure! More recipes to follow. *All opinions above are my own. I have no affiliation with Outdoor Herbivore. Part of the fun of hanging out in nature is the communal eating. Fire, warm food, and community is where our ancestors connected, so it is fantastic to revel in the history. Most people like to think inside the box when it comes to camping food, but with a little planning you can have some great meals out there. Here are my top five favorite meals I’ve had out in backcountry, in no particular order. This is a perfect way to start the day. Pancakes are comforting, filling, and really easy to make. Just get a premade mix or make your own and add water or shelf stable non-dairy milk. I brought pancakes along when we did our first backcountry camp at Big Bend. It was perfect for the chilly October morning. 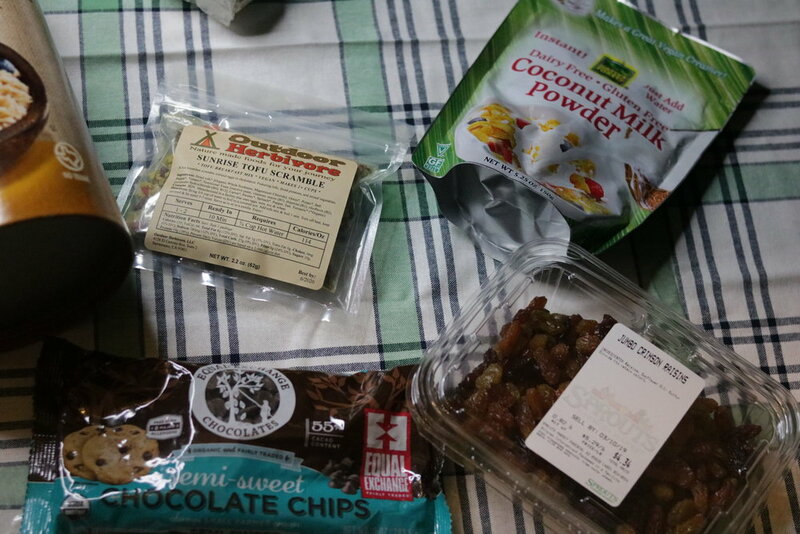 Most of the time I find prepackaged backpacking food to be a bust. It’s either too watery or bland and, occasionally, foul-tasting. This risotto from Good To-Go is an exception. Perfectly spiced. Filling. Ultra creamy. This was a pleasant surprise when we were camping in Arizona. Most of the camping I do is done in the late fall, early winter because Texas is too hot in the summer. Cold sandwiches just don’t cut it when you are dealing with cold or wet conditions. This is one of our favorite no fuss meals when we want comfort and something warming for the body. All it takes is bread, cheese (I use Daiya cheddar slices), non-dairy margarine or oil, and Pacific Creamy Tomato Basil Soup. I love it! If you want to feel super fancy, why not try out some tacos on the trail? All you need is some tvp, taco seasoning, and tortillas. Or if you want to get really fancy, grab yourself some dehydrated tofu scramble and have some breakfast tacos like a true Texan. This may seem super pedestrian, but you can really create some great things with this. 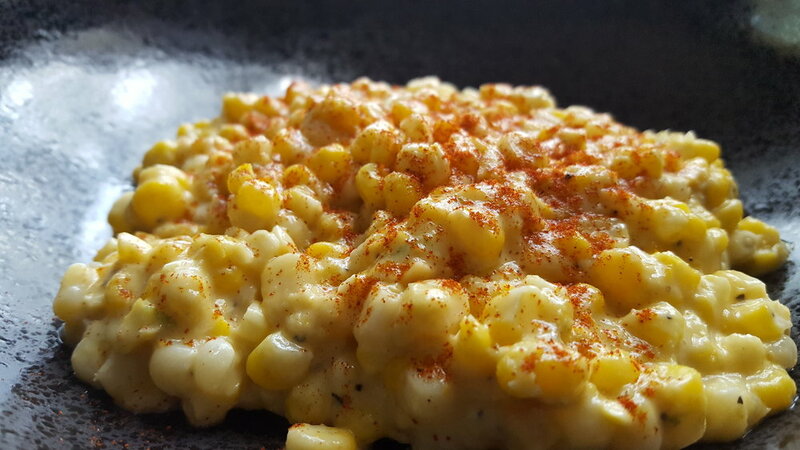 We’ve done grilled corn with all the fixings. I’ve done sausage and pepper packets. I’ve done sausage, veggies, and lentil rice. The possibilities are endless and there are so many vegan sausages out there right now to fit your needs or make your own! Now, let’s talk menu for day 2 of our vegan backpacking trip. There are some new things that I’ve tried. Both the scramble and cous cous are definite winners! The chia pudding was delightful. Recipe coming later this week. Part of the reason I chose this theme for the week is the joy I feel when I’m out on the road or camping in nature. There is a sense of calm and wonderment that takes over me. I find that I start to appreciate my life and all obstacles that led to me becoming the person I am today. There is no way your problems stay looming over you when you are sitting under a giant Ponderosa pine in Montana or staring at the vast desert of Death Valley. Ryan and I have a tradition of taking a photo right before we hit the road on our trips. Every time I see one of these photos, it puts a smile on my face. I remember all the planning and anticipation leading up to that moment, and I see it as the starting point for us getting lost in all of those tiny moments on a trip. What about you? How do you make magic out of your adventures? Leave a comment and share some of your favorite camping meals! Happy MoFoing! There are times when no amount of preparation can save you from unexpected bad weather on a camping/hiking trip. You can read about my first time camping at Joshua Tree here if you want to understand why I fall in love with the unexpected. There is something so wonderfully powerful about experiencing something in a new and unique way. Ryan and I endured something most people do not while camping in the desert. I will never forget the smell of that soaked sand or how cold the air felt that morning. We were the only people in the campground that night, and it felt like the park belonged to us. Since Ryan and I got together, we’ve had the privilege of taking at least two trips together a year. We usually take a huge road trip at the beginning of January, so we’ve seen a lot of unusual weather. The first year, we hit snow in New Mexico and Arizona. We got rained out in Southern California. We shivered the night away while camping in Southern Arizona. At the beginning of this year we happened to arrive at the Grand Canyon in the transition from snow to thunderstorm. We drove into Grand Canyon Village overnight and felt like we had stepped into the past. Even though it was two weeks into January, Christmas lights decorated the entire street. A thin layer of snow covered the ground, only adding to the magic of the night. The next morning did not have weather looking any better. It was less than 60 degrees and drizzling all day. Ryan was a bit bummed, but I really loved it. Ain’t it the truth. Sometimes, you have to experience the unexpected to make an adventure truly extraordinary. If you didn’t check out my post yesterday, please do! I did a little video about a 4 Day backpacking adventure. Here’s the recipe from Day 1 for the pb choc chip banana oatmeal I posted about. Mix everything except for the water together in a quart size ziploc bag. When ready to make in the backcountry, boil water. 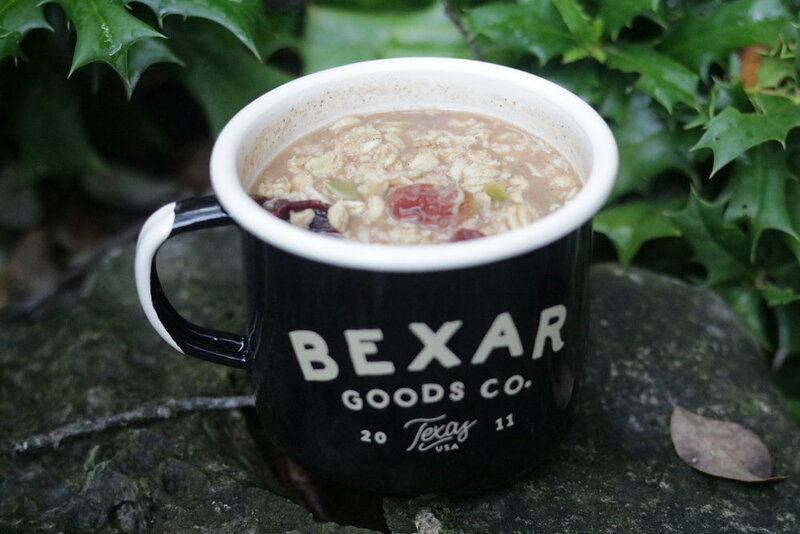 Pour over oatmeal. Stir until combined and let sit for about 5 minutes. The oatmeal was delightfully good and filling. I’m definitely taking this with me out on the trail. I also used that Loma Linda lemon pepper fishless tuna with some Chosen Foods vegan mayo packets. I…was not a fan of the mayo. It completely ruined it for me. I do not want sweet in my pickles and I do not want sweet in my mayo. Um…no. Tomorrow we’ll be taking a look at elevating your camp meal game and the menu for Day 2 of vegan backpacker week. Thanks for reading! Welcome to Vegan Backpacker Week! I'm going to spend this week sharing my passion for outdoors and camping. Look for recipes, vlogs, and cool tips for the next 7 days. Let's begin with preparation. No travel adventure is complete without at least a little bit of forethought. I like to get a feeling for where I'm going and how much access to vegan food I would have. For instance, Joshua Tree has tons of options like restaurants, outdoor shops, and grocery stores. Oh the other hand, you better do a little research if you want to eat past 10p at the Grand Canyon. Today, I'm talking about meals for a 4 day vegan outdoor adventure. All items not purchased from a grocery store came from Amazon, Outdoor Herbivore, and Vegan Essentials. All of these ideas can be scaled down a lot by finding inexpensive alternatives at bargain stores or your neighborhood grocery. Check out the video below for a 4 day trip with vegan goodies. Rico's Vegan Pork Rinds: Check out Sabritones for a much lower price point. Breakfast Tacos w/ Sunrise Tofu Scramble: Try making some bean tacos with Santa Fe vegetarian beans. 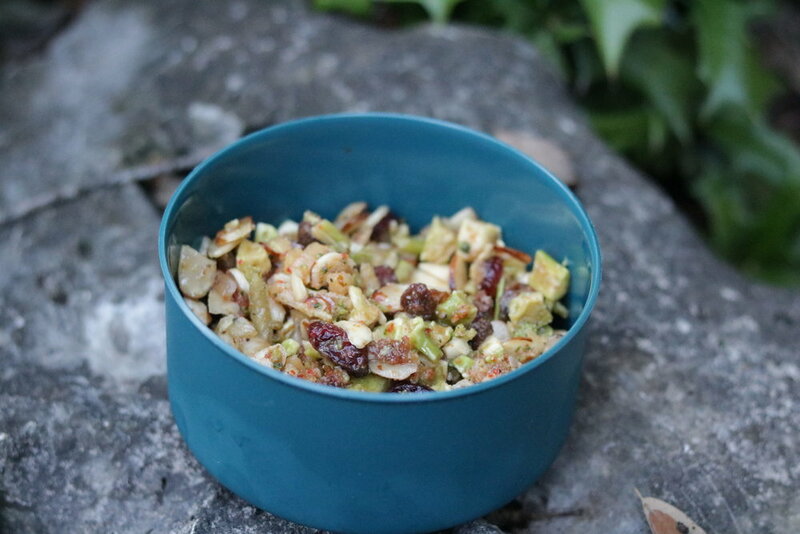 Island Hopper Trail Mix: Try making GORP instead...raisins and peanuts. Throw in some vegan chococolate chips if you're feeling fancy. Daiya Bac'n and Cheddar Macaroni: Switch gears and hit up some Indian flavors with Tasty Bite entrees like Spinach Dal. Stay tuned for the rest of the week, as I work my way through these backpacker meals. Recipes, reviews and so much more! Let me tell you a little story about a woman named Lindsey. Linds is one of my only introverted friends. She is quiet most of the time, but has the sharpest wit that comes out of nowhere. That friend you want around to say something that fills the soul or something so biting that you shake from laughter. Lindsey and I met through work. I remember asking who the new girl was only to discover she had been working in the store for years as the lead receiver. We met through Erika, and the three of us were regular bringers of chaos. I feel like our lifelong bond was cemented one lazy summer day when we were all hanging out and got caught in a very rare desert downpour. The three of us huddled up in Erika's car before wandering around the mall to pass away the boredom. I also remember an epic night at Ace Hotel when Lindsey prevented Erika and me from stupid drunk decisions like taking shots in a stranger's hotel room. She is wonderfully ethereal and dark. She is quiet and wild. She is a truly unique spirit who brings me happiness and love. My favorite memory of Linds was on my 33rd birthday. She came down the mountain and spent the day singing 90s r&b with Erika and me. We sat in the pool drinking beers and reliving our early teenage years. It was one of my top ten moments of bliss. Connection at its finest. When I think of a dish that represents Lindsey, I think of all the times I rang her up at work for fresh veggies, chips, and hummus. Just like Lindsey, this hummus is complex. It's bold and vibrant! It is earthy and whimsical. Roasted beet hummus (for the lazy just-got-off-work-types). I didn't do much for this but cut up some cukes and roast a beet. I added a small roasted beet to a container of roasted garlic hummus. Blended it until smooth. Added the juice of two small lemons and salt. A tiny bit of olive oil. Sprinkled it with cumin, paprika, salt, and more oil. Black sesame seeds for garnish. A toast to Lindsey and the end of inspiration week! When I think of Lindsey, I think of pure joy. I think of how she navigates the world as a dreamer and speaks quietly but with confidence and clarity. I raise an Austin Eastcider's Spiced Cider to Lindsey for inspiring me to feel freedom. Delicious, cardamomy freedom. Whether we're lying under a giant oak in the middle of Joshua Tree or jumping fully clothed into a swimming pool in the dead of winter, I'm inspired by her love of adventure. And don't get me started on Linds' ability to rap Salt-N-Pepa's "Shoop." Mad SKILLZ. Here's to you, Lindsey! Love you!!! See you at the next gathering in April. You know what's more bone-chilling than the upside down? The magical world of online dating. My partner and I met in the fall of 2015 when I was weirdly optimistic about signing up for bad dates again. I was in a...uh...transitional time in my life and dating apps were a distraction from the reconstruction of my life. I didn't think much when I swiped away, but Ryan was my very first match of my very first dating app, and the rest is pretty much history. But this post isn't about the love that eventually blossomed from that day. It's about the people who have enriched my life by the way they surround themselves with love and authenticity. This post is about Ryan's parents, Pam and David Strain. I remember the first night that Ryan told me his mother wanted to meet me. I nearly had a panic attack. I was rebuilding my life and felt mostly like a failure. I was fresh out of a horrific relationship and lacked confidence in general. My mental health was all over the place and I was not sure I'd be able to make a good impression. However, Pam and David were very welcoming and truly charming. I could go on and on about Pam's boisterous laugh and the joy she gets when she is surrounded by family. She has the brightest smile, coolest glasses, and checks in with all of us to make sure we're staying politically aware. WOKE AF! She got us Beto for Texas signs for Christmas for crying out loud! YES! She is smart and opinionated and crafty. And she is an organizing badass. She makes sure every birthday dinner and family trip cultivates joy in everybody. Plus...she makes sure I have vegan dessert when we gather. VEGAN. DESSERT. David is just as inspiring. He lives for authenticity. He wants to know the story behind everything. I could listen to him talk for hours about the origins of a certain wine or the way a spice is harvested. He loves his granddaughters so much and shows them how to be fearless, inquisitive, and self reliant. He raised his children to be accepting, genuine, independent, and imaginative. Plus, he truly gives the greatest hugs. Tonight's dinner is all about them. Pam recently told us that her perfect meal was a bowl of pinto beans with fresh pico de gallo and a slice of cornbread. Well, if that simplicity isn't the most satisfying meal, I don't know what is. And, because, David expects nothing less than the ultimate flavor, I made sure to pack the spice. I used his three favorite peppers throughout the meal. Jalapenos, serranos, and habaneros. Let's go! I don't have a recipe for the pinto beans. They were pretty much borracho beans, though. I started with a large yellow onion sauteed in vegetable oil with garlic, 2 sliced serranos, and 2 habaneros that have been poked to let the spice seep through . Add salt to draw the water out of the onions. Cook until translucent and some bits are brown. Add rinsed and picked over pinto beans and 6ish cups of water. Add some oregano, cumin, and chili powder. Bring to a boil before lowering to a simmer. Simmer for about an hour or until the water is about 1/4 inch above the beans. Add a scoop of Better Than Bouillon No Chicken Base, a tall can of beer (if ya like), and some salt. Simmer for about 45 minutes to an hour. I decided to add even more spice and did some jalapeno cheddar cornbread. It's just a modification of my own cornbread recipe. Fair warning: I prefer cakey, sweet cornbread. For the cheese, I went with So Delicious cheddar shreds. Preheat the oven to 350 degrees and spray a 9x9 inch cake pan with nonstick spray. Bake for 45-50 minutes, until the top looks dry and golden brown. This was seriously the best meal I've had all week. It was filling, non fussy, and warming to the belly. It made me feel satisfied. So good! Finally, I just want to thank Pam and David for the family they have created. I've learned so much from everybody in the past 3 years. I'm thankful that David got me to be more mindful of living in experiences and seeking out knowledge. Whether it's unexpected shots of tequila w/ habanero juice on a chilly Colorado night or learning all the secrets of green lacewings being unleashed upon a garden. And I'm so thankful that Pam taught me that it's okay to break the rules every once in the while. It's okay to play in the dirt and laugh with your whole body and be unashamed. And, thank YOU for reading another inspiration week post. Stay tuned for tomorrow's culmination of the week of love. Happy blogging! People who know me are well aware of my ginger obsession. It soothes me when I have a sore throat. It heals me when I have an upset stomach. It's all around comforting to me. At work, I am known to pull out a ginger candy for anybody with an upset tummy. I like it hot. The spicier the better. What many people do not know is that my love of ginger was probably one of the many traits I inherited from my dad.My dad inspires me in some non obvious ways. I 100% got my love of nature and outdoors from him. I remember him being an avid fisherman when I was a little girl. He used to go off on fishing trips and return with his bounty. I'd stare in disgust as he'd prepare everything for future consumption. Funny that my family never realized I'd become a future vegan. Haha. My dad is also blessed with a green thumb. He can take any garden and make it thrive. I remember gardening being a major facet of my childhood. I grew up on Air Force bases, and my dad was the sole reason we won "yard of the month" every month. He has a natural eye for landscaping and a connection to plants that inspires me to this day. Every time I plant a garden, I can only dream that it turns out as great as his. He inspires me with his connection to nature. That shared trait between us has created a bond that we never knew existed until recently. Today's MoFo is brought to you, in part, by my dad's love of gingersnaps. I decided to make the sparkled ginger cookies from Vegan with a Vengeance. However, I add minced ginger by The Ginger People and crystallized ginger for a mega spicy and chewy cookie. So much greatness. And because I can't have a cookie without washing it down with a tasty beverage, I'm having English Breakfast tea in honor of my oldest, beloved friend Alicia. The fact is that I've known Alicia for as long as I've been alive. Our parents were friends in England when we were still in utero, so this friendship runs deeeeep. She is hilarious and strong and wildly independent. She was my sister before I had a sister. We did everything together as kids, and she was one of the highlights to me moving back home. Alicia will always remind me of running around on base playing tag and late night sleepovers and those prepubescent fights that are nonsensical and last for way too long. She inspires me because she lives life on her own terms. She is bold and brilliant and a survivor. Alicia, this one is also for you. I'll visit you in England soon! Miss you. Love you. Here's to ginger, my dad, and Alicia! A triple threat tea time. Thanks again for reading! I have some blogs to catch up on for now. Do you have a food obsession? Go ahead and tell me about it in the comments! Happy MoFoing! Today, I'd like to talk about a glorious woman who long ago became an extra member of my family. When I first moved to California in 2009, I didn't have a job or any prospects. My partner at the time was trying to build a career and I was down to do something completely different. Up until that time, I had never lived outside of Texas. I had never been so far away from family and friends. That time was the beginning of a hugely transformative experience for me. It was in the midst of a recession, so I could not find work anywhere. I applied for office jobs, waitress jobs, grocery stores...anything I could find. After three years, I took a deep breath and decided to apply to my favorite health food store at the time, Clark's Nutrition. This is where I met Erika. Erika was this wildly gorgeous and inappropriate woman, and I knew from two seconds in that I wanted to be her friend. She started out as my boss and trainer, the almighty standard for front end department heads. She taught me so much about hard work and maintaining a work-life balance. Our friendship grew from those early days of working together. Shortly after I got divorced, I moved to Cathedral City into a loft that was maybe 5 minutes away from her. This is where our friendship solidified. Through breakups and makeups, depression, joy, the wild DGAF-ness of our late twenties...Erika has stood by me through it all. She was one of the first people to help me out when I broke my spine and couldn't drive myself to the grocery store. She checked on me everyday. To this day, when I visit her, she always makes me leave with food and beauty products. She is the Kramer to my Jerry. I am the Wilson to her Tim "The Toolman" Taylor. My favorite thing about Erika is that she loves food! Thai food is her favorite and we spent many a night bonding over beers and sticky rice with mango. Today's post is dedicated to those vibrant memories with my homie for lyfe. She is my sister from another mister, and I love her so completely. For today's MoFo, I wanted to feature my FAVORITE vegan spot ever: Thai Vegan. However, they were temporarily closed due to a gas outage. I almost cried. Instead, my partner and I opted for Thai Dee. Very delicious but you absolutely need to ask about each dish. Some of their dishes have fish sauce, but they will gladly remove it if you ask them. And you can replace every meat on the menu with delightful tofu. Featured above: Ryan got the spicy basil dish, which has bamboo shoots, peppers, onions, and Thai basil. I got my go to favorite in Thai food: eggplant. The green curry has peppers, onions, eggplant, and Thai basil. Yummy! And for good measure, we stopped for boba at Viva Pho on the way home. It was all right, but I think there are more expansive boba spots in San Anto. When I lived in California, Erika and I used to frequent this Asian market called Fil-Am. I loved to get boba there on occasion. This one's for you, Erika! Thank you for being the woman who literally pushes misogynists out of the way. Thank you for all the beer buzzed adventures wandering around Target. Thank you for epic Easter hunt adventures. Tell Mason, Nibs, and Dirty I love them. Tell Chris...he's a'ight. Today's inspiration comes from a lifetime of friendship and love. I have known Brent for just about half my life. I don't remember the exact moment we met, but one of my earliest memories was showing up to his place for an Arbor Day celebration. We got WILD back in those days. Brent always threw the most amazing parties with truly memorable moments. I remember when he was a pale goth kid with bright blue hair and an infectious smile. I instantly fell in love with his dry, dark sense of humor and his huge heart. The thing about Brent is that he will give the shirt off his back to help somebody in need. He is one of the hardest working people I know, and it has given me great joy to see how our friendship has grown and blossomed in the past three years. How I met Chris is a slightly different story. I remember officially meeting him for the first time at Brent's graduation dinner from culinary school. At the time, I was so happy Brent found somebody who brought him such joy. Chris has become one of my special friendships. He has a the most delightfully dark sense of humor. He is so smart and witty and truly connected to nature and the world around him. Fast forward several years, and I had the honor of officiating their wedding. There are moments in life I can never forget. I was so filled with emotion that I could not stop crying as I tried to share the vows they had secretly written for each other. Brent and Chris are two of the kindest, most giving, funniest people I have ever had the pleasure of knowing. Every month, my friends and I meet for family dinners. Most of the time, Brent and Chris come bringing those Hawaiian flavors, and it has been an absolute delight. Here's to my attempt at bringing the flavors of paradise! Preheat a large skillet or wok to medium heat. Pour vegetable oil in the bottom. Add vegan ham, onion, and red bell pepper and fry until tender. Slide the vegan ham, onion, and red bell pepper to the side, and pour the vegan eggs onto the other side. Stir often to cook through. Once cooked, mix the vegan eggs with the vegetable mix. Add the rice and pineapple to the wok. Pour the soy sauce and sesame oil on top. Stir and fry the rice and veggie mixture until heated through and combined. Add chopped green onions and heat through. Feel free to use any vegan egg in the mix. I just happened to have Follow Your Heart on hand. As for the vegan ham, I used White Mountain seitan (with added soy sauce and liquid smoke). Any vegan ham tube from an Asian market is probably preferable. It is super important to make sure your rice has been thoroughly cooled, or you will end up with mush. Brent's fried rice is better, but this was pretty good and easy to whip up! Special thanks go out to my two shining lights of joy and inspiration, Brent and Chris. Thank you for nearly two decades of friendship. I appreciate all the support, love, and advice you've given me throughout the years. I love y'all from the bottom of my heart. Mahalo! How I met Michele is as magical as our friendship. I had been living in the Coachella Valley for a couple of years and had not made a single friend since moving from Texas. At the time, it was just painfully awkward for me to create friendships. I never felt cool enough and was suffering from a lot of social anxiety, which made personal interaction seem like an obstacle too hard to conquer. One semester, I decided to take a geology class at a local community college. In walks this cool looking woman who sat in the back row with me. I might have muttered a passing "Hi" but I almost immediately knew I wanted to be friends. It took several weeks for me to attempt a conversation, but I thought Michele was pretty cool. Always talking to other classmates about her love of science and she was really great at geology. Michele once packed me fruit cups with a bag of Tajin for my road trip back home to Texas. She's basically the best. Here's to Michele and salty, spicy, fruity good ness! The first time I talked to Michele was when I saw her wearing a vegetable shirt and I asked if she was a vegetarian. When she told me yes, I got super animated, and that's when the friendship began. When the semester was nearly over, I nervously invited her to a Festivus party and was delighted when she showed up. We've been great friends ever since. From rainy mornings on San Diego beaches to Whedon Wednesdays to grocery trips when I was rocking a back brace, we have had some magnificent adventures together. Michele has seen me at my best and worst, and loved me no matter what. She is the type of friend I turn to when I want a real answer with no filter. I trust her entirely and she has made me a better intellect, a better feminist, and a better friend. I love her with my whole heart. Today's MoFo is inspired by Michele's love of spice. She loves adding hot sauce to things, putting Tajin on fruit and adding a bit of chile to her esquites. Here in San Antonio, we just call 'em corn cups, and they are mighty delicious bowls of creamy, spicy goodness. And a friggin' food cart institution. Let's DO THIS! Bring a large saucepan of water to a boil. Add the corn and boil for around 5 minutes, until tender. Corn should give a bit but still have that fresh, crunchy pop. While corn is boiling, prepare dressing ingredients. In a large bowl, add the margarine, parmesan, mayo, nutritional yeast, and lime zest together. When the corn is ready, cut the kernels off of the cob and into the large bowl. Stir everything together until thoroughly mixed. Portion off (2 servings as a main, 4 portions as a side). Serve with lime wedge, chile, and hot sauce to taste. Straight up, lime zest isn't a thing in most corn cups. However, I really love lime with chipotle and it does brighten up the citrus a tiny bit. For the parm, I used Violife, but there are so many brands out on the market now. Plus, tons of recipes for you to use. I also like nooch in mine because I'm weirdly obsessed with it and it adds to the flavor. Super easy and delicious snack for when you want to pretend like you're hunting down deals at the Poteet flea market on Sunday. Don't forget to grab an agua de jamaica on the way home! That's all for now! Happy MoFoing! Today marks the beginning of Inspiration Week, and I wanted to kick it off by talking about the woman who has inspired me most throughout my life: my mother. I suppose the best place to start is from the beginning. My mother grew up in the small West Texas town of Abilene. She was one of the younger siblings in a family of 9, raised in a single-parent household by my grandmother, Eula Peoples. From the time I was young, she always told me that, though they lacked in money, there was always a wealth of love to go around. My mother never felt like she was lacking in anything. Her childhood was spent running around with my hilarious Aunt Evelyn and their cousin, Doris, doing absolutely hysterical things that only bored children from a small town would do. Mom and me in '83? '84? My mother was raised by women. Strong, Black, and beautifully Southern women. There is a certain amount of feminism that comes with that. So, from the very beginning, my mother fostered a sense of self love and awareness in her children. A deep and profound respect for our history, equality, and knowledge. It is something that I cherish when I think about my past. It is something that I try to radiate out into the world to this day. My mother was the first to leave home, not for marriage, but for career. She joined the United States Air Force as a teenager and spent over 24 years serving this country. To this day, she proudly works for the United States government as a civilian. My mother has always been my heroine, a success story about following your dreams and being fearless. I think about all the places I've traveled, all the cross country trips I've driven alone...and I am reminded of how my mother did it all before me and in a much more epic way. My mother survived segregation in the deep South. She survived growing up poor in West Texas. She survived being on her own at 19. She survived Saudi Arabia and countless months away from her children. She survived every obstacle she has ever encountered. And she's seen so many wonderful and beautiful things in her life because of it. She is my inspiration in every sense of the word. In a large bowl, mix the yeast and 2 Tbsp of sugar together. Add the milk and melted margarine and stir until combined. Let sit for 5 minutes. Sift flour and salt into the yeast mixture and stir until everything comes together. Knead in enough flour until you get a smooth and slightly sticky dough (usually no more than ½ cup). Knead for about 5 minutes, and place the dough in a large, greased bowl. Cover with plastic wrap and allow to rise until doubled in size, about 45 minutes. While the dough is rising, prep the filling. In a medium bowl, add the granulated sugar, brown sugar, and 2 Tbsp margarine. Mix together using a fork or your hands. Set aside. When the dough has risen, punch it down, and knead it into a ball again. Roll it out into a rectangle that is 10x14 inches. 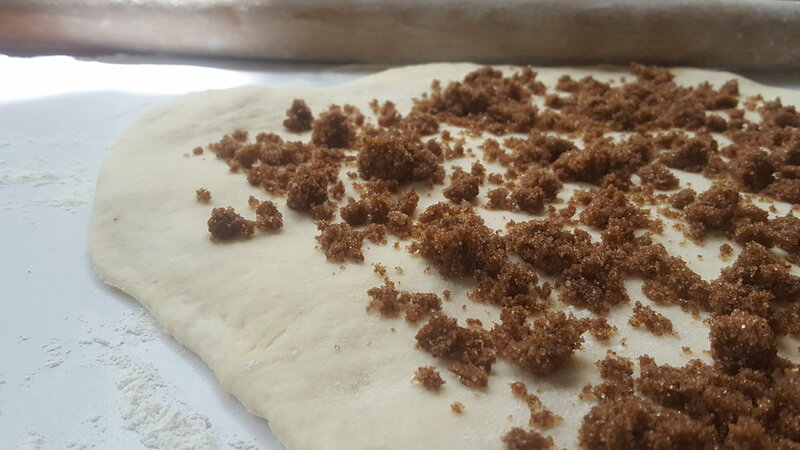 Evenly sprinkle the sugar mixture onto the dough. Roll the dough up as tightly as possible. Close up the roll by pinching the dough together and pinching the ends. Divide into 12 pieces and place in a greased 9x13 inch pan. Brush the remaining tablespoon of melted margarine over the tops and cover with plastic wrap. Let rise again for about 10 minutes. Meanwhile, preheat the oven to 375 degrees. Bake the rolls for 25-30 minutes, until golden brown. Let cool for 10 minutes, while you make the glaze. In a small bowl, combine the powdered sugar, non-dairy milk, and vanilla until smooth. Drizzle over the warm rolls. Above all else, I want to thank my mom. Thank you for all of the stories about our family history. Thank you for every Black Barbie doll you could find. Thank you for Black Santas and allowing us to speak our minds at all times. Thank you for love and acceptance. Most of all, thank you for the neverending support. No words could ever express my profound respect for all you've done for me in my life. You are my inspiration. You are appreciated. My name is Humpty. Pronounced with a "umpty." Allow me to amaze thee with this quick and funky intro to Vegan Mofo! Hello lovelies! It's been a few years since I've joined in on the fun, and I'm so excited to be back for another edition of Vegan Month of Food. Because this is the first mofo post of the season and my first go in three years, I wanted to share some things about myself with you. Please feel free to do the same for your MoFo intro! Southern Cheesy Grits. Tofu Scramble w/ Tomatoes & Spinach. Toast w/ Cloudberry Jam. Spring Panzanella Salad from Power Plates by Gena Hamshaw. Spicy Eggplant w/ Tofu from Thai Vegan. That's all for now, folks! Coming up this month: Inspiration Week, Vegan Backpacker Week, Local Spotlight Week, and Occasions Week. Inspiration Week: I wont' be following the daily prompts this time around, but I'm dedicating this week to all the people/places/things that inspire me. Vegan Backpacker Week: There is no denying that I love the outdoors. A woman can only watch so many You Tube videos before questioning why there aren't more vegan resources out there for the outdoorsy types. Look for tips, tricks, and reviews! Local Spotlight Week: San Antonio is one of the fastest growing cities in the nation. There are so many cool vegan businesses and restaurants so I wanted to share some love. Occasions Week: Anybody who knows me, knows I love a good party...so I'll be finishing out the month following the daily prompts. I'm so excited for all the blogs! Happy MoFoing!!! As a person who prides herself on knowing the pulse of the local vegan community, I was absolutely shocked to discover that Cake Thieves existed...in San Antonio, TX. Several months ago, a friend sent me a link to a Facebook ad showcasing droolworthy vegan donuts. My initial reaction was to book a ticket and fly to LA or NYC or Europe in order to get my grubby little hands on such majestic beauties. However, the video ended with a familiar location...my own backyard! Top row (left to right): lavender lime, salted chocolate, strawberry toasted coconut, maple pecan. Middle row: raspberry almond butter, mocha, dirty chai, lemon pistachio. Bottom row: cinnamon sugar, s'mores, cookie dough, cookies n cream. Naturally, I did what any red-blooded American would do: I ordered one of every flavor and told my friends we were having a tasting party. We each tried a bit of every flavor over the course of three hours. The verdict? Guilty of deliciousness. The best thing about this was that we all came to separate conclusions. My friend liked the cookie dough the best. I was partial to lemon pistachio. Ryan was feeling cinnamon sugar. The consensus for most and least favorite was pretty much unanimous. Salted chocolate was like a little bite of heaven! Dirty chai was not our favorite. Overall, it was a delightful donut experience worthy of the sugar rush. If you have not experienced Cake Thieves, please RUN to give them your money! Their donuts can be found at the following places: Mila Coffee, White Elephant, Cafè Azteca, Berry to Bean, and Larder. Ooh! And exciting news: just yesterday it was announced that Cake Thieves is now available at Bee's Neez Cones and Coffee! And, as always, you can find them handing out goodies every month at the Vegan Stop Shop. Look for the epic line, and you'll know you've found your happy place. In my experience, brunch is a vegan's worst nightmare. Most breakfast foods don't leave many options to navigate your mimosa buzz. One thing that is popping up on menus all over lately is avocado toast. On a recent vacation to Colorado, avo toast was the only non-salad vegan option on the menu. At a whopping $13 for two pieces of bread with smashed avocado and fries, I guess they steeped it in unicorn tears for flavor. If you want to save yourself the twinge of regret I felt, skip the brunch lines and learn to make your own avocado toast. It's the simplest thing in the world. You might be questioning why I am dedicating an entire post to making toast. Quite simply, I'm trying to dismantle a system of overpriced nonsense. I swear to my almighty self that I shall never pay $13 for toast again! Ahem. This is definitely not a recipe so much as it is a method. My method for making this toast is super easy to modify and tastes delicious. Take your toast (whatever bread you prefer) and add sliced or mashed avocado on top. Salt and pepper to taste. Sprinkle with garlic powder and nooch. Add hot sauce of choice. I also like to top with sauerkraut to have something acidic cut through the fat. Also adds a nice crunch. Occasionally, I switch things up a bit. I'll throw hemp hearts and sesame seeds on there. I'll add different types of toppings like tomatoes or kimchi. Also, change up the bread you are using for more fun food adventures! Try it on a bagel...multigrain bread...sprouted Ezekiel bread. There are so many cool possibilities. This is one of my go to quick meals before or after a hike. What about you? What's on your avocado toast?